The entire tube connector range for hydraulic systems from in-house development and production: that was the premise when Stauff Connect was launched in early 2015. A comprehensive range was offered from the outset, with on-going further development. As a result, RSWND banjo fittings in the medium pressure version are now new in the range. They expand the already available range of RSW banjo fittings for high pressure applications with a series for lower operating pressures, i.e. for up to 250 bar. Just as the RSW series, the RSWND series allows the adjustable connection of metric tube at a 90° angle. As the permitted pressure range is lower, the new series is significantly more compact and up to 25 % lighter – an advantage particularly for mobile hydraulic applications. The smaller outer dimensions mean that several banjo fittings can be positioned closer together, allowing a more space-saving design. Stauff manufactures the RSWND series for all common metric outer tube diameters from 6 to 22 mm in the Light Series and from 6 to 20 mm in the Heavy Series. 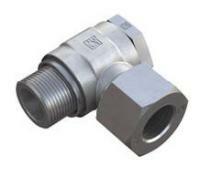 Banjo fittings in the Extra-Light Series are additionally available for outer tube diameters of 4, 6 and 8 mm. The new medium-pressure banjo fittings are available in four versions: with metric and BSP threads, each with elastomer seal (soft-sealing) or retaining ring (metal-sealing) on the male threaded studs. The metal-sealing version requires no internal elastomer seals at all, allowing the fittings to be used in systems with aggressive media as well as in areas with higher temperatures. Components of the RSWND series are coated with a corrosion resistant zinc/nickel surface finishing, just like it is the standard for all Stauff Connect tube connectors. With these characteristics, the RSWND is the ideal banjo fitting for applications in the low and medium pressure range which require a compact and light-weight design in addition to unlimited adjustability during installation.